Few things in life are more irresistible than warm bread fresh out of the oven. Unfortunately, due to the time required by yeasted doughs to rise, this is not a pleasure that can be experienced whenever the impulse strikes. Given this state of affairs (and my penchant for all things corn) I turned to cornbread. It doesn't require any yeast, rising or kneading and can be in your stomach within 30 minutes from the time it occurs to you to make some. Unlike traditional cornbreads, this recipe uses two types of ground corn: Masa harina and yellow corn meal. "Maseca" is a common masa harina (corn flour) brand available in supermarkets. The masa is first roasted which gives it an incredible aroma - the smell of the batter as you mix it up will drive you insane. The bread bakes up nice and moist and is delicious eaten warm with this truffled herb butter. Try not to finish it all at once. Adapted from here. 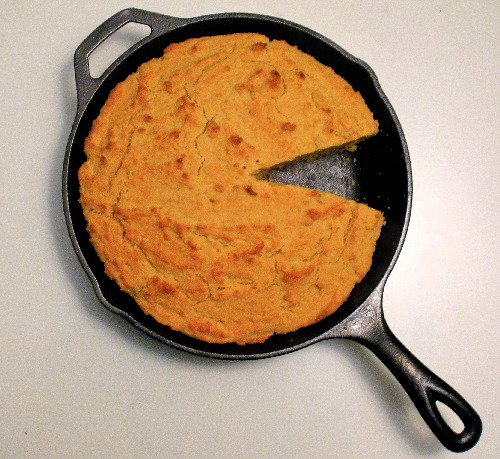 The bread can be baked in a cast-iron skillet or a baking dish. If using the skillet, preheat it in the oven while you mix up the batter. I halved the sugar as I thought the original recipe made a bread that was too sweet. It also calls for buttermilk which I rarely keep on hand. A good substitute for the amount required here is 2 tbsp vinegar mixed into 1 2/3 cup milk and rested for 10 minutes until the milk is slightly curdled. 1. Preheat oven to 400F. Mix the vinegar and milk and let stand for a few minutes until the milk curdles a bit. In the meantime, spread the masa on a baking sheet and bake until slightly browned, about 8 minutes. Transfer to a bowl and let cool. If using a cast-iron skillet, put it in the oven to heat up. 2. Mix the dry ingredients into the masa. In a seperate bowl, whisk together the oil, the milk & vinegar mixture and the eggs, then stir the wet ingredients into the dry ones until a batter forms. 3. Brush the skillet or a glass baking dish with 2 tsp oil. Pour in the batter. Bake for 15 minutes, or until the top is golden and a toothpick inserted in the middle comes out clean. Let cool for 10 minutes.